Buy a home through Habitat for Humanity Detroit. Habitat Detroit sells homes to qualified home buyers for an affordable mortgage. Approved homeowners qualify for a monthly housing payment (mortgage, insurance and taxes) equal to 30% or less of their monthly income. To qualify, you must have need, the ability to pay for your new home, and the willingness to partner with Habitat Detroit. Since 1986, Habitat Detroit has built or rehabilitated more than 350 homes in neighborhoods throughout Detroit and Wayne County, east of Telegraph Rd. 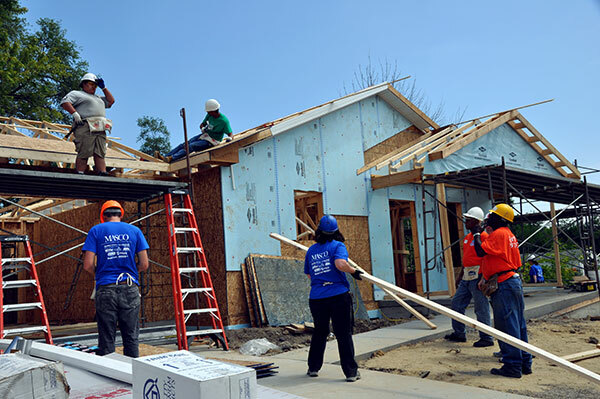 Habitat Detroit is currently building homes in the Morningside neighborhood of Detroit, and in the City of Lincoln Park. Homeownership can be life changing – offering families a safe, stable place to raise their children while building equity every month instead of writing a rent check. Habitat for Humanity of Detroit partners with families to build a new life for themselves through decent, affordable, zero percent interest homeownership. Newly renovated, energy-efficient homes are sold to individuals and families who qualify and are approved for our program. Those who partner with Habitat are community-minded residents who are looking for the stability of homeownership. Habitat Detroit also works closely with our partner families by offering classes that will prepare them to be successful homeowners. Ultimately, we build much more than houses – the impact of homeownership is profound and lasting as a legacy. It’s a program that works! Interested in becoming a Habitat Detroit homeowner? Check out the qualifications below and submit a complete Intake Application. Is your current home unsafe or in need of major repairs? Are you living in someone else’s house? Are your housing costs too high for your income? CAN YOU PAY FOR YOUR NEW HOME? You must have an on-going source of income that falls within the Wayne County HUD income guidelines listed in the chart below under Income Guidelines. You must demonstrate the ability to pay the monthly mortgage, taxes, insurance, utilities, and home maintenance. Once accepted, you will purchase your home from Habitat Detroit with a 0% interest rate and have a monthly mortgage payment. ARE YOU WILLING TO PARTNER WITH US? If selected, you become a partner with Habitat Detroit and you will help build or refurbish your home, and the homes of other program participants, alongside our volunteers. You must be able to contribute 250 (single applicants) to 350 (joint applicants) Sweat Equity volunteer hours. You must provide a $2,000 down payment. If selected, Habitat Detroit will keep in touch with you and provide ongoing support, counseling and various education classes including household maintenance, construction, and many more. You must complete all program requirements within a 6 to 9 month period. Qualifying income maximums are determined by family size and are up to 80% of Wayne County’s area median income (AMI). These guidelines are adjusted each year and are based on numbers defined by the U.S. Department of Housing and Urban Development (HUD). Sources of income include: employment, social security, disability, child support (that is actually being received), spousal support, pension and self employment/business income. ∗ One-person families are eligible for one or two bedroom homes, which are not always available. ** Multi-bedroom homes for large families are not always available. Habitat for Humanity of Detroit reserves the right to revise these guidelines at any time. Need help calculating your annual income? Click here to convert your hourly wage into an equivalent annual salary. Click here for an Affordability Calculator that can be used to determine how much you can afford. By entering details about your income, down payment, and monthly debts, you can estimate the mortgage amount that works with your budget. Habitat for Humanity of Detroit does not require perfect credit, however, your credit score must be 550 or above. We consider families who demonstrate the ability to make regular payments on their bills. Any collections, past due accounts, judgments, or liens must be addressed (this will be reviewed in a one-on-one credit meeting with each buyer). Worried about your credit? We offer credit counseling services to help you understand your score and steps you can take to raise it. Accepted applicants are also required to make a $2,000 down payment (refundable) prior to the closing of the mortgage. If you answer Yes to any of the following questions, you currently do not qualify for the Habitat for Humanity Detroit Home Buyer Program. Do you currently have a mortgage in your name? Have you foreclosed on a home in the last two years? Have you gone through bankruptcy in the last two years? Do you have more than $1,500 in delinquent debt? Is your credit score less than 550? Our current open application period is June 15 – August 15. Along with your completed application, a required $50 Application Fee (non-refundable) must be received. You must also supply copies of the documentation listed below. NOTE: We do not accept originals nor will we be able to make copies for you. Copy of Tri-Merged credit report (3 scores) for applicant & co-applicant from U-Snap-Bac (14901 E. Warren Ave., Detroit 48224; 313-640-1100). Copy of last 8 paystubs for every working adult in the household. Copy of complete, signed and filed Tax Returns (1040s) for 2014 & 2015. Copy of all W-2s and 1099s for 2014 and 2015. Copy of valid driver’s license or State ID (front and back). Copy of birth certificate and/or green card/proof of residency. Copy of 2016 FIA/SSI Income Statements or 2016 award letter (if applicable). Copy of Section 8 Voucher (if applicable). Copy of Child Support Documentation – last 4 months of income OR child support order (if applicable). Letter signed & dated from all nonworking adults in the household (age 18 or older if not in college) stating that they are not currently employed (if applicable). By submitting an Intake Application, you are stating that you have read and understand all income qualifications, guidelines, and requirements of the program. If preferred, you may download this Intake Application and mail it or submit it to the Habitat Detroit office (14325 Jane Street, Detroit 48205). Please send any questions to HomeInfo@HabitatDetroit.org. You will receive a response within 48 hours.